Hey all and happy Wednesday! Hope you all are having such a fabulous week so far! The weather is warming here, and hopefully for the long haul. It has been teetering back and forth so much recently, but it looks like it is hopefully here to stay! I need to get my pool and tan on this summer, mainly a little bit of a tan! I am always in search of a good black dress, but I feel like sometimes they are tougher to come by than they should be! While I am searching for a black dress, I am also searching for a slightly more unique one. I want one with a bit of edge to it, something that I can wear to multiple places and on multiple occasions! I recently found out about Sika Collection from a friend of mine, and I was instantly in love. The pieces are gorgeous, made well, and definitely hold up. There is always this looming fear when wearing clothes as a curvier woman, a fear that they will rip or tear, especially after several different wears. It is finally nice to find a brand that is made of good quality materials, and the pieces are comfortable enough to wear all day. I also love a good dressy look, so these dresses really made me happy! Hope you all have a fabulous Wednesday and wonderful week ahead! I love your dress!! It is so cute!! This black dress is absolutely stunning! I am loving the cut of it, so unique! Love this LBD with a twist on you! Super pretty! Really liking the hair too! This LBD is so different! I love how it’s asymmetrical, and the top balancing out the bottom! I love the shoes you paired this with, so pretty! I love this dress on you!!! WOW! Oh this dress is absolutely STUNNING on you! I love the assymmetrical shoulderline! Gorgeous! girl you look SO fab and chic! I love the style of that dress! You accessorized it so beautifully too, love it! 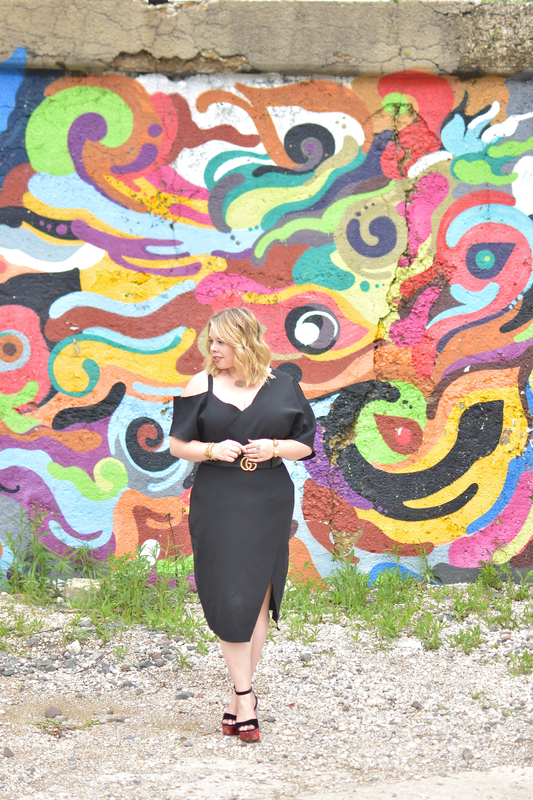 Love the chic black dress & such a fun wall! !